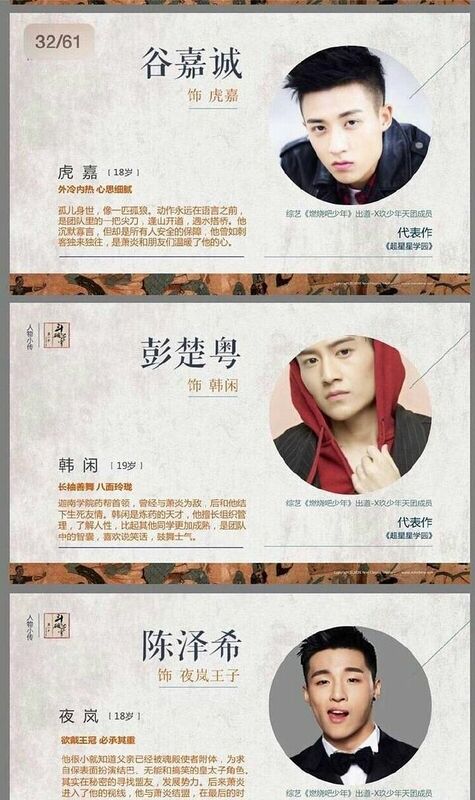 Our dear Leo Wu Lei as Xiao Yan was confirmed months ago, the others are not, but filming begins in December. Cross your fingers! Our male lead is described as a sly and unstable person. Lol. He’s crazy? That’s even better! His power is lost because it was absorbed by a spirit in his ring (given by his mother). The spirit needed his power to wake up from a deep slumber. The spirit then becomes his master. Actor Baron Chen and Li Qin. 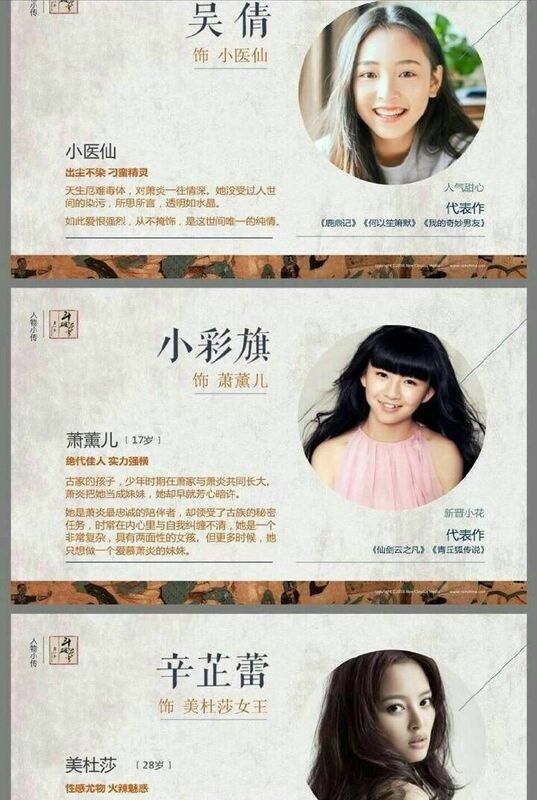 Her profile says she’s playing Na Lan Yan Ran, Xiao Yan’s former fiancee who broke up with him after he lost his powers. Janice Wu Qian, Xiao Cai Qi, and Xin Zhi Lei. 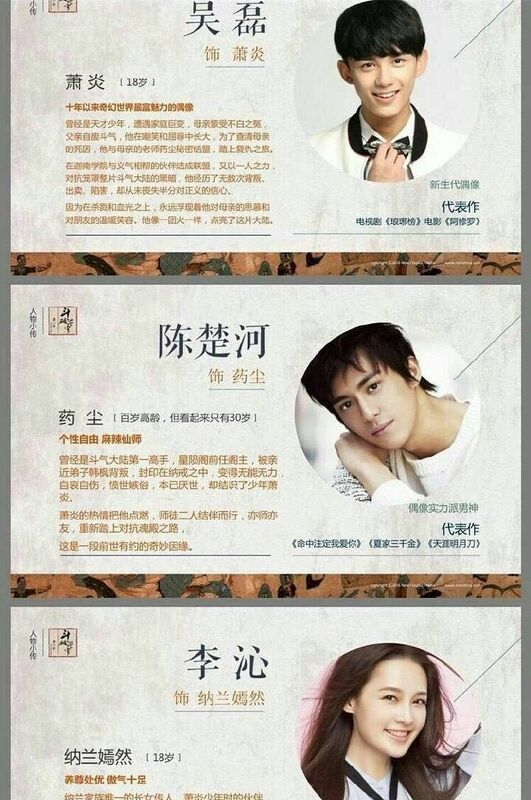 Janice plays a girl with a poisonous body, Cai Qi is a childhood friend of our male lead, Xin is a snake woman. The boys from Star Academy, Ringo Yu, and Carman Lee??!!! Gu Jia Cheng, Peng Chu Yue, Chen Ze Xi. Xiao Zhan, Wu Jia Cheng. —-> Where to Read the Novel? 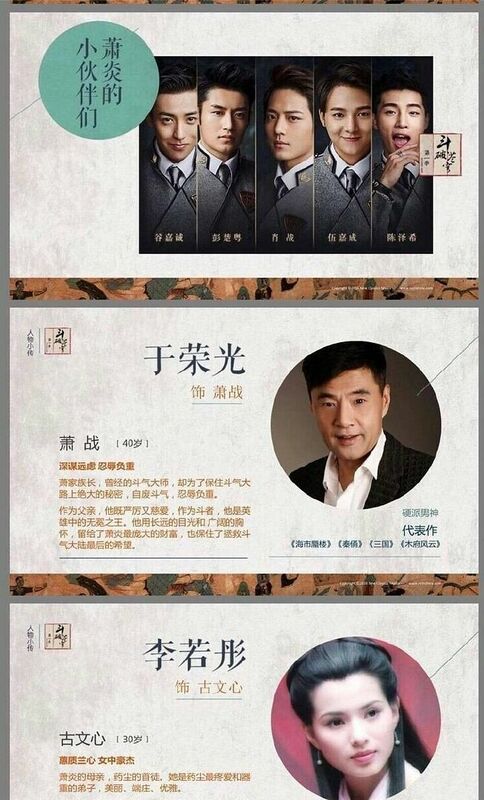 This entry was posted in Entertainment News and tagged Baron Chen, Battle Through The Heavens (Fights Break Sphere 斗破苍穹), Carman Lee, Cdrama, Emn Chen Ze Xi, Janice Wu Qian, Jason Gu Jia Cheng, Leo Wu Lei, Li Qin, Novel Adaptations, Peng Chu Yue, Wu Jia Cheng, Xiao Cai Qi, Xiao Zhan, Xin Zhi Lei by Kappy. Bookmark the permalink. This was my first chinese online novel, I started reading because the update to the Manhua was too slow and became addicted and couldn’t stop reading. It was so damn long! Gotta give myself a pat on the back for completing the book — a feat I probably cannot repeat..
My fave character is Yao Lao, he’s the best T__T and fave female lead is Medusa, Xun’er was just too bland.. Na Lan Yanran didn’t play a big role in the book, I recalled that her teacher Yun Yun was more of a female lead than her? But didn’t see her in the post, perhaps her character was scrapped..
Quite intrigued to see how the production will turn out, given the extensive material — they probably need to film for monthssssssss..
Was reading through the characters description and our male lead marries both girls? Medusa and Xun Er? Can you clarify the bit about the “R” scene between our couple? I’m really not into these types of scenes so I wanted to know the story behind the incident. Thanks! Yes he marries both girls at d same time. there wasn’t much of a “R” scene i think, as in nothing explicit. OMOOOOOOOOOO!! Leveling up…. so many creative ways in games. Lol. They had me at Leo insane male lead, but when I scrolled down and saw the names.. CARMEN!! My Gugu!! 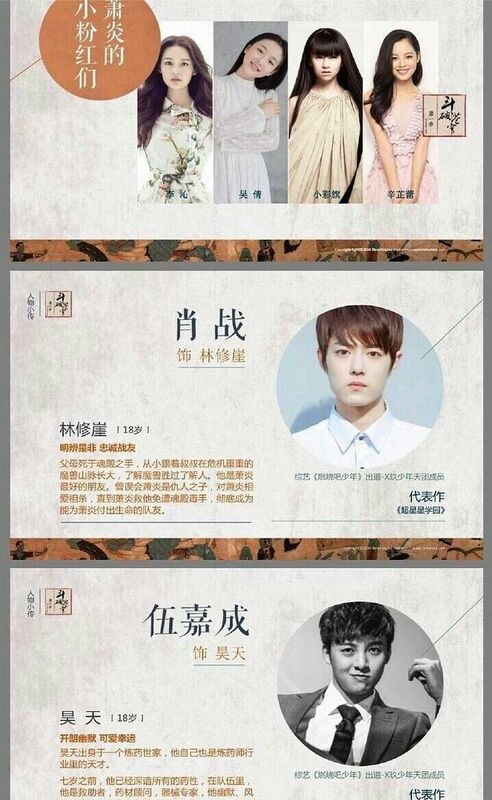 Wu Lei for Xiao Yan… YAY!!! Childhood friend? Is it Xun Er (the girl whom he cherished very well) or his other cousins (Xiao Yu or Xiao Mei). Janice as the Fairy Doctor, I approve!!! The snake lady aka Queen Medusa should have a very enchanting and bewitching body and face, especially the eyes (that’s what the novel described her as). Somehow she’s “forced” to follow Xiao Yan because of certain circumtances. I think it’d be a high budget drama if you look at how the story goes. I’m looking forward to Snake Woman. She’s quite the bewitching visual. I think that’s the danger of adapting long novels. See Chusen for instance, things in the novel and things not in the novel = messy and repetitive. They need to pick story arcs that flow together, are exciting, and push the story forward. It’s hard. I think it has to do with the writing style of this book, the whole book is like a written version of a RPG. Even the levels seem like something out of a RPG. The whole book is about him going through training -> levels up -> meet stronger foes -> training -> levels up -> meet stronger foes -> training -> (repeats till he reached the highest level). Personally feel that Chusen novel is much better (writing wise) but didn’t watch the drama so cannot comment on the adaptation. Keeping fingers crossed that this adaptation can turn out fine, they can probably reduce the repetitive parts and just keep those significant events else they will not be able to finish filming? !